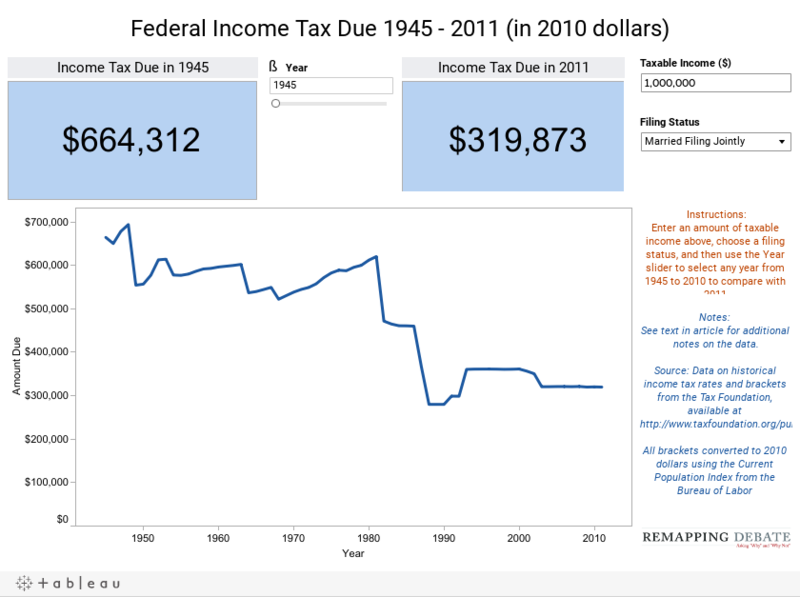 April 12, 2011 — At a time when both the President and his GOP adversaries are looking to lower income tax rates, it is helpful to get some historical perspective — a process that quickly reveals that federal income tax burdens are near post- World War II lows. Comparing the federal income tax burden over time on individuals and families up and down the income spectrum presents a variety of challenges, not the least of which is the absence of an interactive tool — let alone one that takes varied income, tax brackets, and tax due over a long period of time and adjusts for inflation. Remapping Debate has developed such a tool, which allows comparisons to be made for the entire post- World War II period in terms of 2010 dollars. There are a number of obvious limitations in using the tool. For example, the additions and subtractions to gross income (that yield adjusted gross income) change over time. The deductions that are available to yield taxable income from adjusted gross income also vary over time. The tool, however, only addresses taxable income, and thus doesn’t account for those changes. Likewise, the difference between ordinary income and income from capital gains (the latter currently gets preferential treatment) is not accounted for. The tool only deals with income tax, not payroll tax (payroll tax as currently structured exacts a disproportionate burden on lower- and middle-income taxpayers). Nevertheless, users will be able to make a host of observations. Two that we’ve noted: the halving of the tax burden from 1945 to 2011 for a married couple with taxable income (in 2010 dollars) of $1,000,000 saves that couple more than $340,000 over the tax bill that they would have had to pay back in 1945. A similar percentage reduction in tax burden for a married couple with taxable income (in 2010 dollars) of $30,000 saves that working class couple only about $3,350 over the 1945 bill.